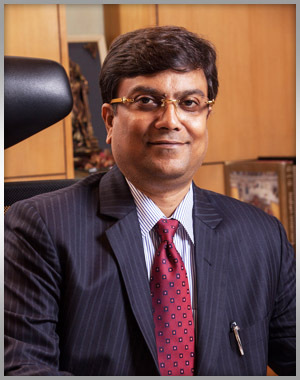 Passion is what drives excellence, Mr. Surya Prakash Bagla has been the real sunrise to the zest to excel and create prosperity. He comes from a traditional Marwari & noble business family from the city of Kolkata. Having an in born business acumen, he went ahead to nurture his dreams as a first generation entrepreneur after completing his studies. He founded the Saltee Group at a very young age, which he has built substantial brand equity. Honesty was the only investment of Mr. Bagla that never failed him in his journey. The attitude determines his altitude, not aptitude. Over the past years he has completed number of projects in Salt Lake and North Kolkata. "Haveli" which is the only ethnic vegetarian restaurant located in the heart of Salt Lake City was conceptualized by him, has earned the vivid distinction of being the Pure Vegetarian Multi-Cuisine Restaurant. Accomplishing his name in hospitality, the new venture of star facility Hotel Project in Salt Lake is being set up which will add glory to the hospitality segment in Eastern India. He has also redefined "chilling" by setting up World Class. 'Ice Lounge' near Swabhumi, Kolkata. He is a person of passion and stern believer in performance to perfection. He believes that if one "avoids fear, it grows; faces the fear, it goes." In spite of his busy schedule, he is always eager to contribute to the well being of the society, having been associated with diverse social & philanthropic organization.